With the announcement in 1985 of Porsche’s first production supercar, the 959 changed the automotive landscape as we knew it. It was the first supercar for the street with revolutionary technology — a sophisticated all-wheel drive system with torque-vectoring differentials, twin-turbos, 6-speed manual transmission, Kevlar-body panels for weight savings and strength, and a 2.85-liter power plant whose architecture was derived from Porsche’s own racing engines. Combined, these components would yield a car that was equal parts futuristic as it was advanced. Ahead of its time by at least two decades, the 959 laid the groundwork for the continuation of the 911 with its technology applied to future models. The 959 secured the fate of the Porsche 911 and proved that the rear-engine formula had a future that would go on for decades. Packaged neatly into a physical form that was both familiar and evolutionary of the Porsche design heritage, it would go down in automotive history as one of the greatest sports cars of all time and be a forerunner for the future of supercar technology. Bruce Canepa was one of those fortunate enough to be able to experience a 959 in 1987. He immediately began the process of analyzing and evaluating the systems and components of the 959 to determine how to bring this incredible car into U.S. compliance. As if the task at hand wasn’t hard enough, doing so without forfeiting the performance characteristics of this Porsche added an additional challenge. Canepa was successful in legalizing the first 959 for the United States and today, with over 30 years of hands-on experience with Porsche 959s, Canepa remains at the forefront with continued engineering and development. Over the course of the 959’s legalization process, its performance ascended to modern supercar levels. Always pushing the envelope and looking for the next way to better the already prodigious platform that Porsche created, Canepa was successful with the first performance upgrade for the 959 in 2001. The Canepa Generation I performance upgrade was the first milestone for the 959, stemming from the creation of the emission-legal 959 that took advantage of modern technology to boost power to 576 horsepower. The Canepa Generation II performance upgrade took the tried-and-true formula and delivered even more performance with 640 horsepower. The Canepa Generation III performance upgrade takes the 959 even further, approaching a staggering 800 horsepower while putting Canepa 959s in the same playing field as modern hypercars. Now, after three decades of diligent research and development with countless miles driven from real-world testing, Canepa presents the ultimate Porsche 959 and turns it up to 11. The Porsche 959SC is Canepa’s newest evolution of Porsche’s legendary automotive icon, combining Canepa Generation III performance, a concours-level mechanical and cosmetic restoration, numerous mechanical and performance upgrades, a one-of-one paint to sample exterior and a custom trimmed interior to produce a 959 unlike any other. It represents the culmination of all the greatest aspects of research, design, engineering, state-of-the-art technology and concours restoration that Canepa has been directly involved in over the past three decades. Had Porsche continued with the development of the 959, it would most certainly look and perform something like this. During the 4,000+ hour process of building each Porsche 959SC, modern day technology is seamlessly combined to produce an evolutionary 959, with modern day performance that is effortlessly accessible without sacrificing any luxury and comfort for the driver. Limited to only 50 units, Canepa’s expertise in 959 technology and concours-level restoration sets these cars apart from any others on the planet. Interested in learning more? Click here to email Canepa. Beginning with an original Porsche 959, the car is completely stripped of every panel and system, down to the last component part. Once all items are removed and cataloged, the tub is then prepared extensively for its concours-level paint work. The Kevlar-epoxy body surface is expertly sanded to ensure each panel is laser straight, with each and every square inch of the car looked over and inspected, ensuring that no surface is missed. Parts of the tub with rubber sealant are addressed by hand, ensuring the new paint adheres to every surface without fail. With the Porsche 959SC using Canepa’s modified and upgraded 959S suspension design, the hydraulic fluid filler cap on the driver’s side is removed (as factory 959Ss were delivered). 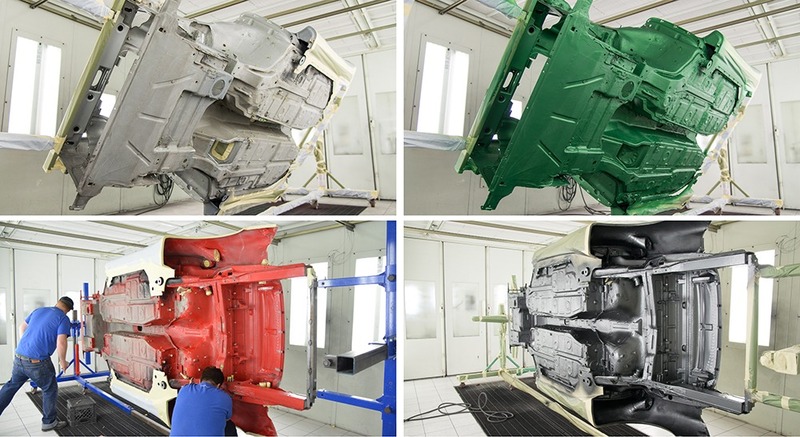 Over 500 hours are spent on the body alone before entering Canepa’s paint booth. Benefiting from three decades of technology advancement, the Porsche 959SC approaches 800 horsepower. Creating 75% more horsepower than a stock Porsche 959 with overall reliability remaining the same, the Porsche 959SC eclipses many modern supercars’ performance. 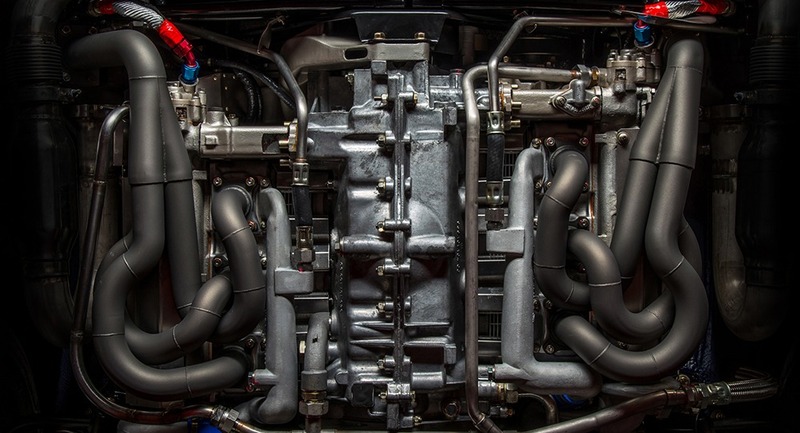 The new non-sequential twin-turbo system features the latest technology Borg-Warner units and a new engine management system is employed, ensuring that each Porsche 959SC can be tuned to the pinnacle of performance. The fuel systems and ignition systems have been redesigned and upgraded to support the stratospheric levels of power now being created. Equal length headers are custom fabricated to each 959 engine and turbos, increasing flow while reducing turbo lag. The newly developed stainless-steel exhaust system creates a spine-tingling symphony of bass and air-cooled noises all at once. In addition, the entire clutch system has been modified and upgraded to improve pedal feel and actuation. During the build of a 959SC, all mechanical systems of the car are disassembled and inspected. All components and systems are rebuilt and restored, many to better-than-factory specifications, ensuring that components will hold up to the formidable amount of power now being produced. Over 3,000 component parts are refinished in their associated coatings whether its anodizing, zinc plating, powder coating or Teflon coating. All suspension components originally painted are coated with the latest powder coating techniques which ensure longevity of the surfaces for years to come. 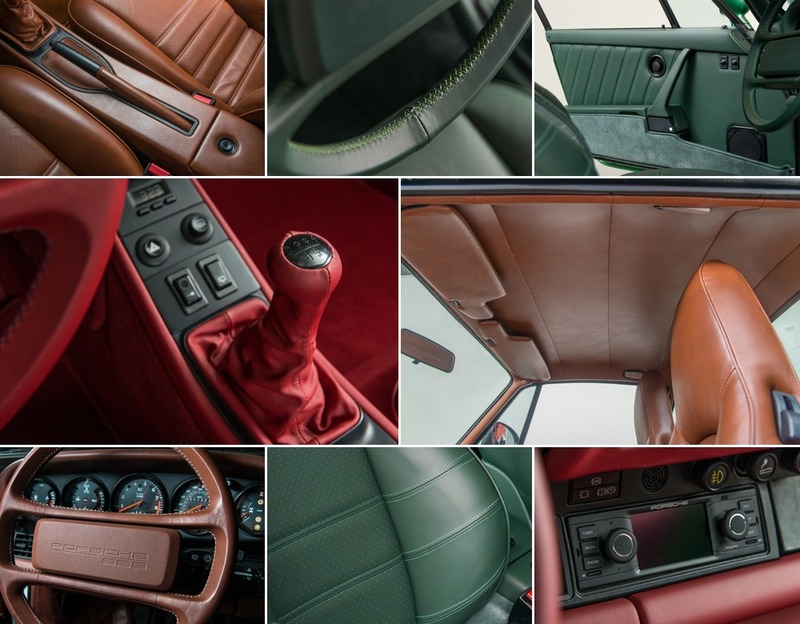 The Porsche 959SC is for any enthusiast or current 959 owner who wants a genuinely unique 959, with exterior color options and interior finishes that mirror Porsche’s own offerings. With most factory 959s originally delivered in silver, red or white, Canepa offers the 959SC with Porsche’s own paint-to-sample color palatte. Bruce Canepa and the new owner collaborate closely and extensively, going through countless options and comparing paint samples with leather samples for the interior. No two 959SCs have the same exterior and interior color, creating a truly one-of-one design. From Seal Grey to Emerald Green, Pearl White to Liquid Metal silver, the only limit is your imagination. Interested in learning more about Canepa’s Porsche 959SC? Email us by clicking this link.